-some relatively mild (0.1g) lateral forces affected the craft. The second one in particular ... started the 8 second sequence that doomed the craft. -During these all-important 8 seconds, there were several lateral forces that corresponded with rudder movements. -the plane lost the rudder and tail at the end of this 8 second sequence. -the plane flew out of control as result. -the pilots reacted by calling for maximum power and making statements (recorded by the CVR) to the effect that they were losing, and had, lost control. The pilots of Flight 587 were probably unaware the tail fin and rudder had broken off as they struggled to control the plane, Black said. Without those parts, the jetliner would have suffered a loss of stability and turning control. "They don't have a rearview mirror," he said. "They have no idea they've lost a tail." "When they start talking about max power ... they've gone into recovery mode," Black said. "And they might be recovering from the wrong thing, because they don't know" that the tail fin is gone. This all seemed to justify the NTSB's focus on that 8 second sequence since 5 large rudder movements during that period seemed to hasten (if not cause) the demise of the rudder and tail fin. We're all familiar with the fact the NTSB released a Safety Recommendation to the FAA on Feb. 8th regarding the need for pilots to be trained that full rudder deflections at certain speeds (as seen on AA 587) could jeopardize the rudder and tail. This all seemed reasonable ... until the FAA released the ATC and TRACON tapes and the transcripts (thank you FAA ... and I'm sure the Allied Pilots Association will also thank you). I started with basic data the NTSB had made available in Public Statements. Specifically, there were 93 seconds between liftoff and when the FDR died. The CVR continued recording for 10 seconds, until (NTSB believes) impact with the ground. The FDR rudder data became unreliable 2.5 seconds before the FDR quit. PASSUR and other sources quoting the NTSB, provided me with the liftoff time of 9:14:34. Aviation Week and other news sources quoting the NTSB provided me confirmation of CVR information the NTSB had released ... specifically, when certain milestones occurred such as the call for "max power" and the comments about "losing control". 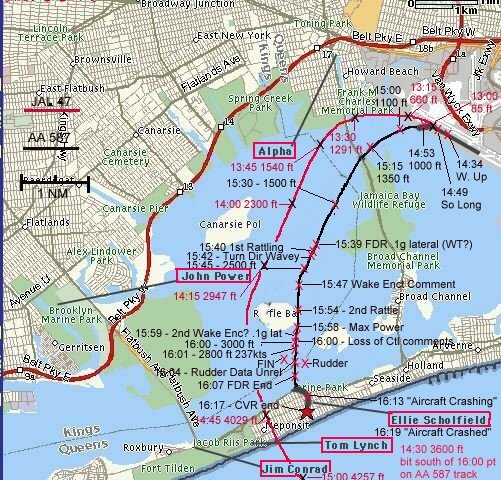 FAA Tower and TRACON tapes were also incredibly helpful in placing the "out of control" or "losing control" cockpit comments into the timeline and a pilot (or pilots) who informed JFK ATC of the crash gave me confidence my calculations were accurate. PASSUR and other web sources, provided some radar tracking information including the final transponder reading. As you can see, the NTSB, not looking to release detailed timelines until docket opening, didn't go out of their way to help us piece together all this information into a coherent tineline. It would have been nice. But once I had the "markers" above, merging the CVR, FDR, FAA, PASSUR (radar) data together was sufficient and produced shocking results. There really isn't much room for error here. In fact, there is very little room. The sharpest criticisms I will make are made using NTSB data alone. Little to no speculation. Little to no witness statements incorporated. I do briefly discuss them, but they are not necessary in order to raise these serious issues. Arthur Doucette has modified the witness and flight path map to include flight milestones and any radar data we could get our hands on (and the JAL47 flight track). Also ... it'll help for you to listen to this mp3 sound file of the JFK Departure Control FAA tape (about 1 megabyte download - 4 minutes with 56K modem) from 15 minutes and 37 seconds (15:37) to 16 minutes and 25 seconds. The "noises" I will explain in detail below occur 21 seconds in from the start of the sound file (the first noise at 15:59 in the FAA transcript), 24 through 26 seconds into the sound file (the second noises at 16:02 and 16:03 on the transcript), and 32 seconds in (not on the transcript but the time is 16:10). The portion I say is human speech is at 16:03 (24 to 26 seconds from the start of the sound file). The first notable event in this flight was the first lateral movement, not a violent one at that, about 1/10th of a G-Force. This occurs at 15 minutes and 39 seconds after the hour, 65 seconds after liftoff. The NTSB has been pushing the theory that this was wake turbulence. Many aviation experts agree that no weather-aloft data has been produced by the NTSB to prove this theory. What is factual related to the wake turbulence discussion is that Japan Air Lines Flight 47 was 90 seconds ahead of AA 587, was 400 to 1000 feet above 587, and it's flight path was mostly parallel to 587's and approximately 3/4 mile west (PASSUR). Basic math requires those wake vortices produced by JAL47 to have traveled at near 30 miles per hour for a full 90 seconds in order to cross the path of AA 587. No weather data released to the public has affirmed this. Winds at ground level at takeoff for AA 587 were out of 300 degrees at nine knots. Yes, the pilot mentioned wake turbulence. Since the math does not yet support the theory of a wake encounter we have to conclude the captain mistook the lateral movement, and subsequent airframe rattling, for wake turbulence. But whether you agree with my wake turbulence statement or not is irrelevant to the destruction of this craft. So read on. Now, keep this time in your mind: 15:39 (15 minutes, 39 seconds after the hour). The first lateral movement. Which can be something other than wake turbulence. I place Witness Alpha here. He may very well have witnessed the event related to that first lateral movement. Immediately, after this first lateral movement, one second later, at 15:40, the CVR records airframe rattling. Only three seconds from that first lateral movement (at 15:42), there is the final, clear, communication from AA 587 to TRACON Kennedy Departure Control. This is pure speculation, but the pilot seems to be distracted by something, possibly the airframe rattling, as he hesitates by uttering a long "uh" at the start of his final communication, "uh uh turn direct wavey american five eighty seven heavy". You can hear the pilot saying this a few seconds into the sound file I've posted. Eight seconds from that first lateral movement, at 15:47, the Captain makes a comment (on the CVR) about "wake turbulence". Was the Captain turning to his First Officer and offering an experienced guess, or was he declaring it so? We may never know. 15 seconds from the first lateral movement, at 15:54, the NTSB tells us the CVR again records rattling. Only 19 seconds from the first lateral movement, at 15:58, the First Officer, who was flying the plane, calls for maximum power. This is significant. And its implications are equally shocking and broad. As the NTSB's George Black Jr. has previously educated us, when pilots ask for max power, they are in recovery mode. They are attempting to recover from a very bad situation. What bad situation? They have yet to encounter the 2nd lateral movement (or the 2nd wake vortex as the NTSB has stated)! The all-important eight second sequence (before the FDR quits) the NTSB has so often drawn our attention to has not yet begun! The rudder and tail do not separate for another 6.5 seconds! The pilots are already trying to save the craft and all the souls onboard before the rudder has made the large, and dangerous movements. This is shocking! If you do not understand yet the significance of what you just read ... re-read the previous 7 paragraphs. When it "hit" me, I was stunned for quite a while. Why such a reaction? Because we have heard nothing from the NTSB as to their focus on the 19 seconds before the oft-mentioned 8 second sequence that follows. This revelation screams at us ... "I'm the important sequence, not the 8 seconds that comes after me!". We have seen no FDR data to offer any insight into those truly critical 19 seconds when the pilots went from a 0.1g lateral movement to recovery mode. It would seem that serious investigative focus should be placed on that first 0.1g lateral movement at 15:39 to discover it's true source, not to speculate about wake turbulence that may have found a way to accelerate itself! Have you seen this 19 second sequence presented in this manner before? I don't think so. I would suggest the NTSB give serious attention to the eyewitnesses. The NTSB has yet to return to New York City to do one-on-one interviews with the witnesses at the locations where they spotted the plane. Of course they haven't come yet. Oh ... they will ... but they're taking their time. After all, they proved in the TWA Flight 800 investigation that the testimony of hundreds of witnesses can have no use in determining the cause of an accident ... that witnesses see black when there is white, that they say "up" when something went "down", that they say .... "missile went up" when they really saw a beheaded plane doing that instead. Thanks to the aerodynamicists at the CIA (isn't their function solely foreign intelligence??) for a video animation of the plane doing just that, which violated generally accepted rules of aerodynamics, and thanks to another group of aerodynamicists at the FBI for publicly thanking the CIA. If the data I'm working with is so wrong as to put the "max power" comment by the First Officer after the destruction of the rudder (that would require the data I'm referencing to be out of sequence by more than 6.5 seconds), then the blame rests with NTSB for releasing bits and pieces of flawed data to the public that is so misleading as to give rise to this article. If your reaction is, "the NTSB is simply not done yet. Give them a chance". Nonsense! The NTSB had placed the pilots recovery mode after the destruction of the rudder. They have made no public statements indicating they (a) realized that was a major misstatement on their part, and (b) what they were doing to investigate the 19 second sequence that preceded the 8 second sequence. 15:59: The second lateral 0.1g movement. This is the start of the eight second sequence that ends with the FDR quitting. The NTSB states this 0.1g lateral movment is wake turbulence. Aviation experts have stated to me that an explosion in the fuselage of the plane (that vents outward) would generate a lateral movement. One other very interesting thing occurs at 15:59 (this assumes the FDR and FAA tapes are closely syncronized and I believe they are since the timeline's start and end times fit perfectly). There is the first of four noises on the TRACON audio tape (21 seconds in on this sound file). The FAA only mentions three. It appears they just missed the fourth. These four noises occur within an 11 second period where no other communications occur with AA 587 or any other plane. NTSB's George Black Jr. mentioned them as well in a Press Conference when he stated there were "noises" on tower tape of communications between controllers and Flight 587. The noises were heard at about the time the crew lost control. (from Aviation Week). It may not be a coincidence that these "noises" begin (at 15:59) just one second after the First Officer (at 15:58) had called for "max power" in an attempt to recover from a very dangerous situation. What are these noises? They could be a couple of things at the same time. They are attempts by the crew to communicate, as I will show. They are probably also proof of catastrophic disturbances on-board the plane that are affecting the communications system and producing these noises and garbled speech. On board disturbances that will probably also knock out the transponder's ability to transmit (in less than 7 seconds) and the FDR's ability to record (in less than 8 seconds). Mind you ... we've just now hit the start of the NTSB's key, eight second sequence. Has it "hit" you yet? 16:00: we are only one second into the NTSB's key, eight sequence. We are only two seconds from the First Officer's call for max power. And according to information the NTSB released, the "crew" (not just the Captain) is now making several comments about loss of control on the CVR. 16:01: Last Transponder reading at 2,800 feet. In other words, something happened to the plane that prevented it from returning the last two or three radar pings it might have returned before it crashed. NTSB states cessation of electrical power could do this. What affected electrical power to the transponder? As stated earlier, it could very well be that catastrophic disturbances (explosions, fires) on board had a negative impact on the communications system, and these disturbances (which I believe cascaded throughout the plane) also could have affected the transponder's ability to return a radar ping. One thing it was probably not caused by ... the engines no longer providing power. The engines didn't break away from the craft until the last 3 seconds of flight ... around 16:14. So the plane would still have had two transponder pings to reply to with the engines attached. 16:03: someone from the AA 587 crew states something to the effect "losing control" or "out of control". There is a lot of intereference ... but the word(s) are not impossible to understand. This portion is 24 to 26 seconds in on the mp3 file. The fact that this "comment" from the crew is at this point in the timeline (16:03), in sync with the NTSB's start period for these comments on the CVR (16:00 and forward), indicates that my timeline, if in error, is no more than 2 to 3 seconds out of sync ... not enough to place the "max power" comment from the First Officer after the rudder departure event. Also relevant, the NTSB has stated no communications were attempted by the crew because they were too wrapped up trying to save the craft. A noble speculation. But many aviation professionals have wondered aloud ... why didn't the crew even attempt one communication? They did. This plane didn't crash for another 14 seconds from this garbled communication. It's is certainly not a wild speculation that the crew attempted communications again but the on-board disturbances had severely crippled this system along with the transponder and FDR. Speculation has circulated that these events occurred because the engines had separated. The NTSB has stated that sound spectrum analysis has shown the engines were running after the loss of rudder event (at 16:04.5) and as I stated earlier, they were attached to the plane until approximately 16:14. 16:04.5: According to the NTSB, the point at which the rudder data becomes unreliable; also the possible point where the rudder and vertical stabilizer have ripped away. 16:07: the FDR quits. Apparently, the third system to fail in a span of 8 seconds. Yet the engines are still attached and the plane is still 10 seconds from impact. The only catastrophic event that has occurred to this craft according to the NTSB is the tail separation. That would knock out three on board systems?? 16:10: the fourth and final unintelligible noise during a chatter-free 11 second period from 15:59 to 16:10 (from the TRACON tape). Earlier, I speculated these communications could be both disturbances (fires, explosions) from the plane and/or communication attempts. 16:10 corresponds very closely to the time when witnesses Jim Conrad and Tom Lynch saw the first of two explosions on the craft when it was several seconds from impact, with the vertical stabilizer still attached to the plane (possibly loosened) and the engines still attached. Their testimonies are here (Jim) and here (Tom). I will make a quick comment/speculation here that is supported by all the data in this article, the rudder pictures U.S.Read acquired from the U.S. Coast Guard, and many of the witness statements: the rudder broke into three pieces and landed in the Bay separate from the vertical stabilizer by at least 200 yards. It did so at least 7 seconds before the vertical stabilizer, which would explain the smaller piece John Power saw fly off (he said it was the size of a cargo door, nearly matching the size of the upper rudder piece) when the plane was still near 1,800 to 2,000 feet, and how Jim Conrad and Tom Lynch saw the vertical stabilizer still attached to the plane when they spotted it (around 16:10). 16:11: The pilot (in another plane probably on the ground ... or less likely, an airborne police helicopter pilot) who tries to alert the Tower to look straight ahead (6 seconds before the crash) would have seen AA 587 at just the time Jim Conrad and Tom Lynch did. Therefore, there is a strong possibility the pilot who said "straight ahead" saw some, all, or none, of what Jim and Tom saw. I get the feeling we won't find out too much information about this individual. We sure would love to hear what he/she has to say. 16:13: the rest of the timeline below speaks for itself. May the Souls of the Deceased, and their grieving loved ones, know Eternal Rest. And may our questions be answered. Thanks to Arthur Doucette for getting me started on this timeline and thanks to Bob Durant for interpreting Tower communications for me (many of the italicized comments below related to Tower communications are from Bob). These two folks and many others have been so helpful to me and continue to be. 13:29 LC (Local Control): "american five eight seven heavy wind three zero zero at niner runway three one left cleared for takeoff" (Local Control Transcript - LCT). JFK Tower clears AA 587 for takeoff. Tower gives the surface winds as from 300 degrees at nine knots, which is about ten miles per hour. The runway heading for runway 31L is 313 degrees, so the wind is slightly left to right. 13:33 AAL587: "cleared for takeoff american ah five eight seven heavy" (LCT). AA 587 reads back and acknowledges the takeoff clearance. 10 14:44 LC: "american five eight seven heavy turn left fly the bridge climb contact new york departure good morning" (LCT). JFK Tower gives the "bridge climb" and "contact departure" instructions. The tower operator turns his attention to the airplane next in line for takeoff. 15 14:49 AAL587: "american five eighty seven heavy so long". AA 587 acknowledges the clearance. Passed off to JFK Dep. Control. (TRACON). 27 15:01 AAL587: "uh new york american five eight seven heavy thirteen hundred feet we're climbing to five thousand". JFK Tower has told AAL587 to contact Departure Control. They do and give their current altitude and target altitude. This helps the controller to crosscheck the transponder altitude readout. The flight path is the predetermined standard departure routing. 31 15:05 J108 (JFK Departure Control / TRACON): "american five eight seven heavy new york departure radar contact climb and maintain one three thousand". "Radar contact" means that the departure controller has positively identified AA 587 on his radar screen. With this, he clears AA 587 to continue climbing to 13,000 feet. As you may have noted, all numbers are stated to insure clarity, i.e., 13,000 is not enunciated as thirteen thousand, but as one three thousand. 63 15:37 J108: "american five eighty seven heavy turn left proceed direct wavey". Now Departure Control clears AA 587 to deviate from the standard departure routing, and to "proceed direct wavey." Wavey is a navigation fix far from JFK, but on the long range routing flight plan. One of the pilots inserts this position in the navigation computer. The airplane may or may not be on autopilot at this time. In either case, the navigation computer produces the heading to wavey, and the airplane is turned toward it. The airplane is continuing to climb while this is taking place. 65 15:39 FDR records first acceleration (or sign of any trouble at all) averaging about 0.1g lateral ... "consistent with wake vortex" according to the NTSB (Source: NTSB). 66 15:40 Rattling noise on CVR (Source: NTSB). Last "clear" communication with JFK Departure Control. AAL587: "uh uh turn direct wavey american five eighty seven heavy" (TRACON). AA 587 acknowledges and reads back the clearance. This is the last transmission from AA 587. 73 15:47 Wake encounter comment by captain on CVR (Source: NTSB). 80 15:54 Rattling Noise on CVR (Source: NTSB). 84 15:58 First Officer calls for maximum power (Source: NTSB). "Unintelligible" noise on TRACON tape; plane is in trouble; first of four consecutive noises within an 11 second period that NTSB Member George Black referred to at a Press Conference on Nov. 13th which he said were heard about the time the crew lost control. Interestingly, this is the same moment the plane encounters the second 0.1G lateral movement (NTSB states consistent with wake turbulence). This is the start of the 8 second sequence before the FDR quit recording where the rudder experienced several, questionable, large movements. 86 16:00 Crew makes several comments on CVR about loss of control (Source: NTSB). 87 16:01 Last Transponder Reading (Radar Return) at 2800 feet, 237 knots, latitude 40.5873, longitude 73.8502 (PASSUR). 88 16:02 "Unintelligible" noise on TRACON tape. Plane is clearly in trouble. Second of four consecutive noises within an 11 second period. 89 16:03 "Unintelligible" noise according to the FAA on the TRACON tape. However, I disagree that it is unintelligible. I can make out the phrase "losing control" on the tape. This is the third of four consecutive noises within an 11 second period. 90.5 16:04.5 Rudder data becomes unreliable, according to NTSB, 2.5 seconds before FDR Quits. NTSB says plane at 255 Knots (in 2/8/02 safety rec.). CVR Sound Spectrum Analysis by NTSB confirms engines STILL running. Aviation Week sourcing NTSB and the NTSB in their release say FDR shows lateral acceleration increases to 0.8g, yaw rate of 10 deg/sec., left bank through 25 deg. with pilot applying right wheel, pitch down to -30 deg." 93 16:07 FDR Quits (93 seconds after liftoff based on NTSB Press Releases). 96 16:10 "Unintelligible" noise (similar to first three); this is the fourth consecutive NOISE which spanned 11 seconds.This 4th noise was not on the TRACON script. It should be. 97 16:11 UNK (Unknown pilot): "straight ahead" (local control transcript). It appears a pilot has spotted AA 587 in trouble (6 seconds before the crash) and is trying to draw the Tower's attention to it. FAA and NTSB must have identified this pilot. 99 16:13 UNK: "tower look to the south there's an aircraft crashing" (local control transcript). 103 16:17 CVR Quits (based on NTSB Press Releases), 103 seconds after liftoff. NTSB believes the CVR quit at impact. 16:19 UNK: "an aircraft just crashed to the south of the field" (local control transcript).